Sound cues are as important as visual ones in today’s games, so you can’t afford to miss any. That’s why the Logitech G Pro Gaming Headset makes such clever use of positional audio – the tech that lets you hear which direction those footsteps are coming from, how far away that gunfire was, and exactly where you need to run. The headset is compatible with Sonic 7.1, the surround sound in Windows 10, and Dolby Atmos, for the best in clear and complex soundscapes. Pro-G Audio drivers are a new hybrid mesh design that stays distortion-free even when the bass is booming, too – even the biggest explosion or filthiest soundtrack won’t throw you off track. The noise isolation on this headset is exceptional – up to 50% better than rival brands. That’s a huge advantage in maintaining tactical awareness, in staying immersed, and in sheer playing pleasure. The headset’s ergonomically-shaped pads sit securely right around your ears, avoiding pressure hotspots during long sessions and creating a highly effective seal against the outside world. The pads are shaped foam, covered with a premium leatherette fabric that resists sweat and stays comfy. Rest assured, if the Pro Gaming Headset can isolate against huge crowds, it can certainly cope in a household ‘blessed’ with children, competing TVs and multiple music playlists! This is a device that’s built to last whether you’re at home streaming, playing competitively at a venue, or constantly traveling in between. Stainless steel sliders, fiber-reinforced nylon joints, and a tough, flexible headband create a rugged chassis, while polymer shells keep overall weight to a super-low 259g. When you’re playing for hours at a time, perhaps many days in a row, a headset you only notice when it’s not on your head – rather than when it is – is more than just an advantage. It’s vital. Great sound is only half the equation: everyone else on the stream needs to be able to hear you clearly, too. That’s why the pro-grade boom mic operates at a higher sensitivity and wider frequency response, yet gives – vitally – a lower signal-to-noise ratio than before. The Pro Gaming Headset works with PC, PlayStation 4, Xbox One, and Nintendo Switch, and it comes ready to connect with any of them. It also includes a 2m cable for easy set up whether you’re streaming at home, killing it at a LAN party, or heading to a major event. Given how the G Pro’s shape follows its pared-down, high-quality, high-function design brief, it shouldn’t be a surprise that it looks sleek, stylish, and serious. If you were expecting form over function, in the belief that great function doesn’t create it’s own great form anyway… sorry about that. It’s not just the class-leading noise isolation that attracts pro players to the Pro Gaming Headset. Any headset they use has to create world-class sound, transmit clear and utterly dependable speech, survive constant packing and travel, and function for hundreds of hours with total reliability – failure is not an option. 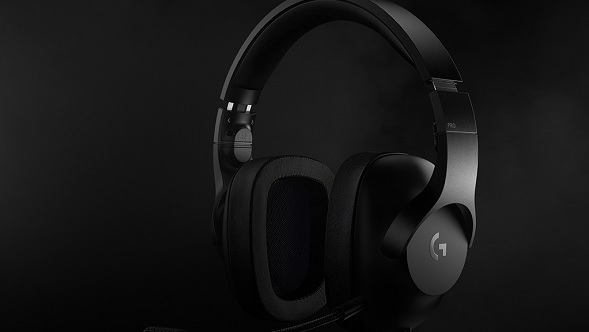 The Pro Gaming Headset is now available to own from Logitech G.